THIS POST HAS BEEN ADDED TO OVER SEVERAL DAYS TO COVER FOUR OF THE PARK HOMES. IT’S NOW COMPLETE. In 1985 an excellent three part video series was released entitled “The Treasure Houses of Britain.” This entertaining and informative series presented the history, architecture, furnishings, art pieces and decor of some of the great houses of Britain from as early as the 15th century. 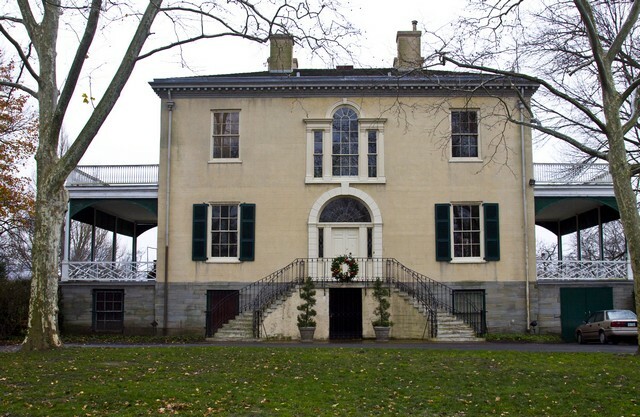 While not as famous as the British houses, the Delaware Valley enjoys seven of its own “treasure houses” from the 18th and early 19th century, all conveniently located within Philadelphia’s Fairmount Park. There are, of course, other fine 18th-19th C. homes in the area but the Fairmount Park group is special for its concentration and location. They benefit as well from their association with the Philadelphia Art Museum, particularly as to their furnishings. These homes were built along the Schuykill River by wealthy Philadelphians as show cases for their wealth but also as retreats from the city’s summer heat and the threat of yellow fever. They are decorated for the holidays as a part of the annual Holiday Tours program and I went through five of them last Saturday. The holiday program continues through the 13th but they can be visited at other times of the year as well. It is a well worthwhile trip. 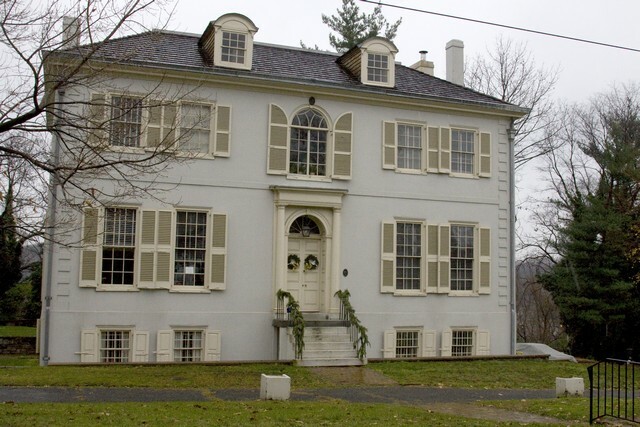 The house above, left, is Mount Pleasant, built in the early 1760’s by Captain John McPherson, and once described by John Adams as “the most elegant seat in Pennsylvania.” It is certainly a magnificent example of Georgian or Palladian architecture with its external and internal balances of architectural features. Note the Palladian window in the lower right picture. In the 1984 TV series about George Washington which featured Barry Bostwick, Mt. Pleasant was seen as Washington’s headquarters in…Boston. Artistic license. It was also owned at one time by Benedict Arnold. Here are two views taken inside. The punch bowl looks to be a piece of very finely decorated Chinese Export Porcelain. Above is Lemon Hill. Even the house names are fun and evocative: Lemon Hill, Cedar Grove, Sweet Briar, Strawberry Mansion, Woodford, Mount Pleasant. The Lemon Hill house dates from 1800 on land that had been owned by the Revolutionary War financier, Robert Morris. The view above is that facing the river and is not as impressive as the front which greets one on arrival. Nevertheless, note the symmetry, the dual stairway to the door, the fan light over the door, and the Palladian window on the second floor. Here are two scenes inside of Lemon Hill. On the left is the second floor passage, referred to as the Palladian Hall for the window that permits so much light into the second floor. Below are three scenes inside Woodford, once the scene of Tory gaiety during the British Occupation of Philadelphia. An early Georgian style house dating from the late 1750’s, it was built by William Coleman, said to be a close friend of Benjamin Franklin. It didn’t really arrive at Middle Georgian status until the second floor addition in 1772. The furnishings are the property of the Naomi Wood Foundation which leased Woodford from the Park in the 20’s, to restore it to display her collection. What stands out in the left picture below is the handsome desk and book case with its open bonnet pediment and finial, and the tea table to the right. In the right picture we see a seasonally welcoming table with a five level, glass epergne centerpiece and handsome side chairs (two versions of shield backs.) Against the wall center is a wine chest; on the left, a sideboard with a knife chest (right) and a Federal style urn executed in silver. 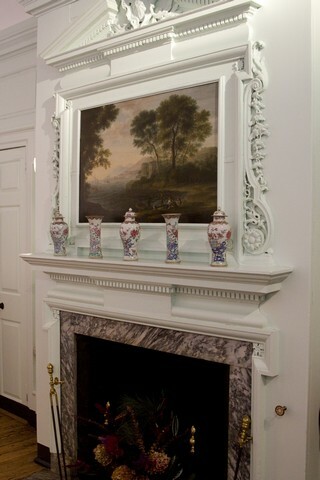 The bottom picture is of a magnificent mantle, featuring dentil moulding and exquisite carving, with a beautiful garniture set. Although one cannot see the carving in the open pediment I suspect it’s probably a Phoenix bird, typical for such carvings before the revolution. 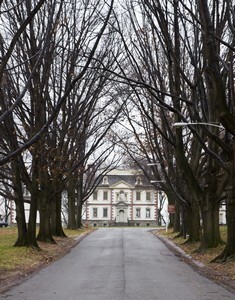 The picture below is of Sweetbriar Mansion, another name with which to conjure. This house was built in 1797 by Samuel Breck, a Philadelphia merchant. In contrast with most of the other homes in the Park, Sweetbriar was used as a year-round residence. We hear complaints about the commute into Center City. Imagine what it was like on horseback in 1797. Here are two of the rooms within Sweetbriar. The one on the left is known as the Etruscan Room. Note the fine Federal mantle, the small cranberry-colored fire screen (to prevent the heat from melting a lady’s facial wax) , and the tea table in the foreground. On the right, another attractive tea table with a decorative piece of onions and lemons. Ralph, you couda—shouda been a guide. Only then would you have known that Robert Morris was ONE of the financiers of the Revolution. Chaim Solomon was another one. Morris even borrowed money from him. He seems to be ignored by so many trying to be English Main Liners. I always will wonder why. Wonderful photography and commentary. Thank you for sharing it with me. Great Photos !! and the info is priceless. A great tour Ralph and commentary. Nice post!! I have read some of your posts and is really impressed. I am adding your blog to my RSS Feed reader.